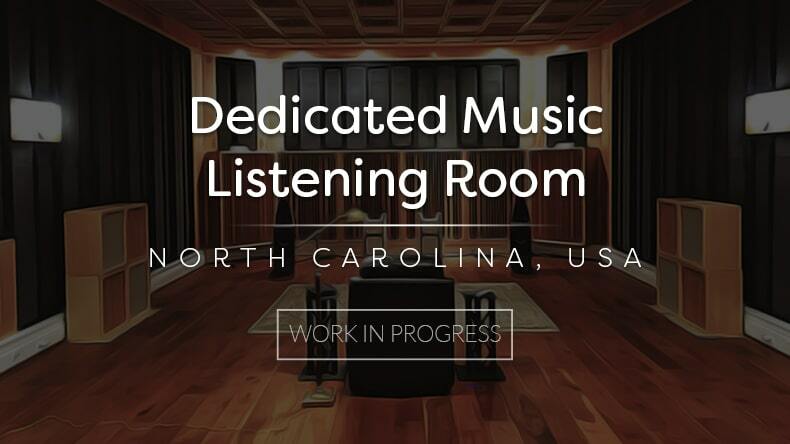 A dedicated listening room is a special place. It is a dedicated room just for one purpose and one purpose only. It is a room to listen to music in. It is a room to listen to two channel audio presentations in. It is a room to let go and let be with just your music and yourself. It is a room where you can shut the door and let the world go on without you for a while. It is just for you and the music. 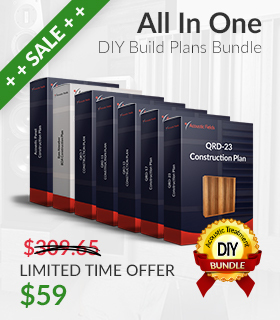 This project was designed to be built from the ground up. There were no restraints on size except the ceiling height. We could use any width or length but needed to make both those numbers work with our twelve foot ceiling height. This is a common occurrence since governments restrict the heights in most developments to sizes that make the structures all have similar heights. The project ended up with a width of 27′ and a length of 33′. All of this wonderful width and length occurring under a twelve foot ceiling height. 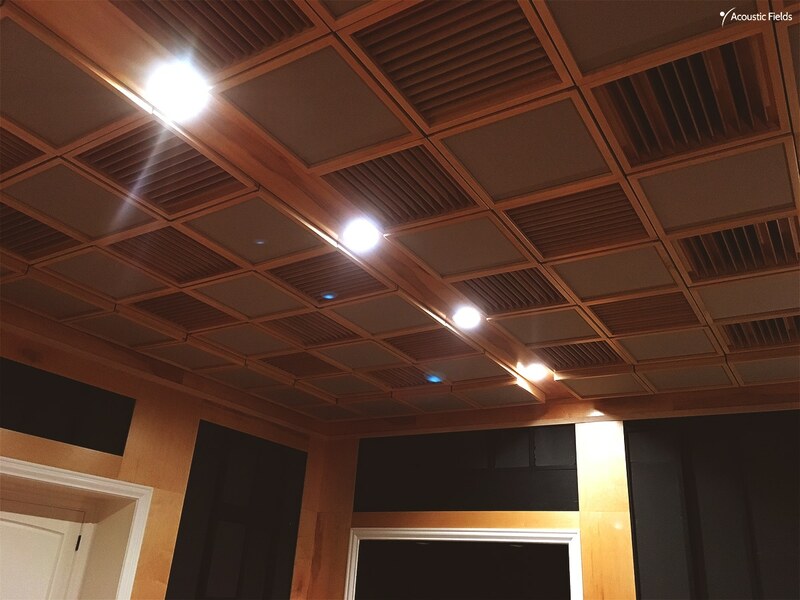 The ceiling is composed of our ACDA -10 and ACDA -12 ceiling modules. These provide the necessary lower frequency absorption requirements dictated by the floor to ceiling distance. 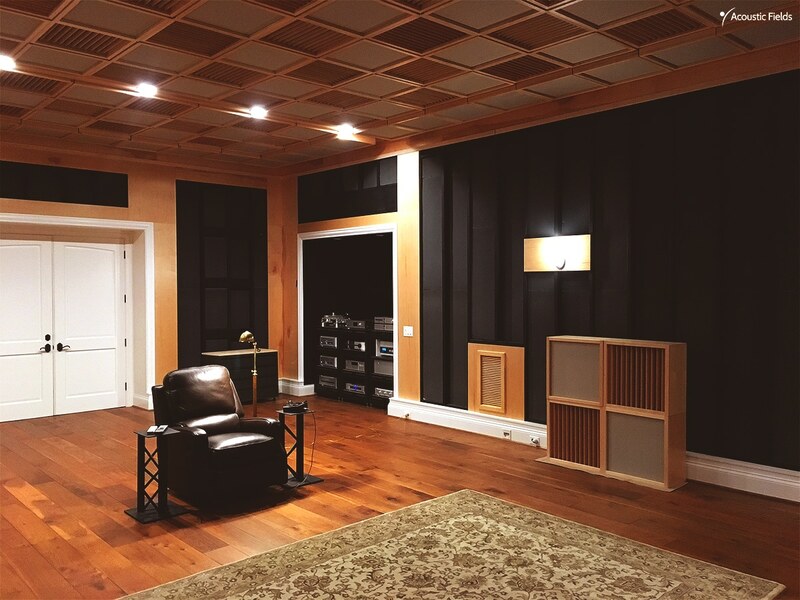 The side walls contain our carbon technology where we actually measure the frequency and amplitude of the unwanted low frequency issues present in the room and tune the stud space depth to meet that resonant frequency requirement. Along with the ACDA units for the ceiling comes our P-13 diffusion modules. These quadratic diffusers are arranged in a vertical and horizontal array across the ceiling to produce two dimensions of diffusion. The combination of both the P-13 diffusion and the ACDA-10 units produce a surface area that not only deals with the lower frequency pressure generated from a 12′ ceiling height but also minimizes the height restrictions psycho acoustically by reducing the time signature of reflections. This combination makes the sound appear to be generated from a much larger room. Tuning is accomplished by adjusting the depth of each stud space cavity to include the resonant frequency of the issues in that part of the room. Cavity or stud space depths are adjusted from a minimum of 6″ to a maximum of 10″. The deeper the depth, the lower the resonant frequency starting point. Adding our carbon filters between the studs and inside the cavity we just created increases the rate of absorption. The depth of each carbon filter is adjusted to match the depth of each cavity. Once we have managed the low frequency issues within the cavity spaces created by the studs, we will then seal each cavity with a face plate that has the correct density to deal with each frequency and amplitude within that wall and room position. On top of the face plate, we will install our foam technology. The walls will then be fabric covered. The black areas on the side walls represent the spaces for the fabric. Front wall diffusion is in the vertical domain which represents a horizontal diffusion spread across the front of the room. 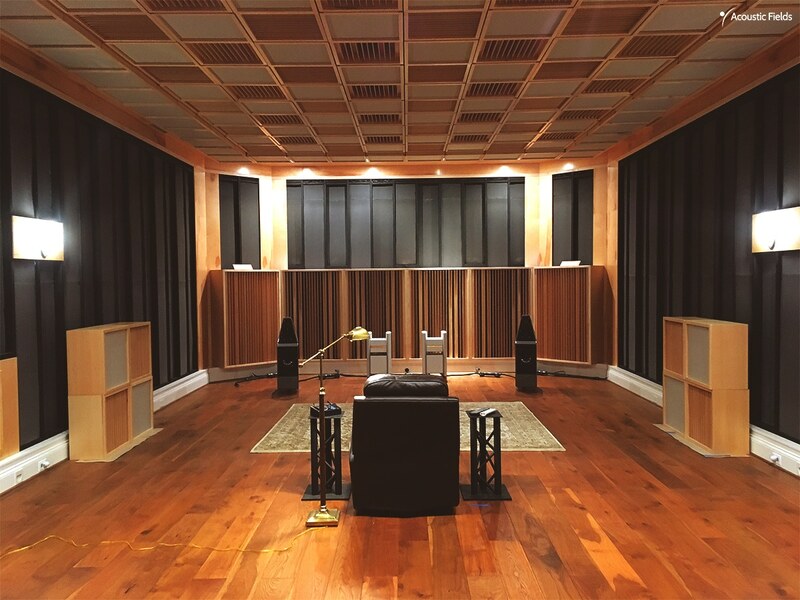 Two rows of our newly designed P-23 quadratic diffusion units create a 10′ wall of diffusion to match the new 6′ high speakers which will be arriving soon. Rear wall diffusion will be a two dimensional array of both broadband and high frequency units to add sparkle to the high end and middle frequency definition and separation. If you are ready for your own room with your own music and just yourself, there is nothing like having a dedicated personal listening environment. In this room, everything is under control. Low frequency issues are non issues with separation, definition, attack and decay equal to middle range. The middle and highs are so free of room sound that you can hear what the singer had for breakfast.The emotional connection can not get any stronger. Room resolution is as high as your formats played. Spaciousness and air are everywhere. Come to this or any of our other projects to hear for yourself. These rooms are life changing events.